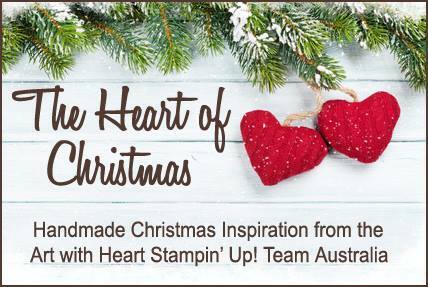 Hi everyone and welcome to week 5 of Christmas inspiration with Art with Heart Stampin'Up Team Australia. For todays card I thought it would be fun to use the Coffee Cafe bundle, its my favourite at the moment (well one of them anyway) So stamps sets (bundles) I used are the Coffee Cafe Bundle and Oh What Fun for the sentiment. I used Garden Green Card Stock for the base, on the white mat I sponged Real Red & Crumb Cake. I used Be Merry DSP, I just teared the green herringbone paper on the side and sponged it in Garden Green ink. 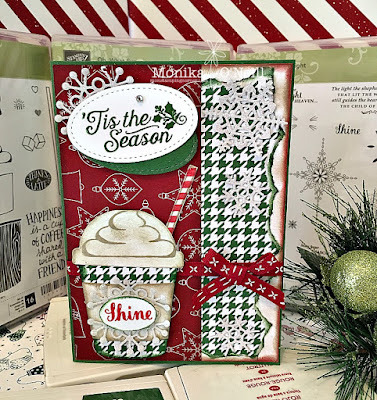 I used the thinlets to cut out the coffee cup using the Big Shot with the green herringbone paper, the straw is from coffee cafe bundle, I inked the straw with crumb cake then used the stripe stamp with Real Red to give the straw a candy cane look. For the white & garden green senitment I used the Stitched oval Framelits. The snowflakes are from the Seasonal Layers Thinlets cut from Dazzling Diamond Glimmer Paper. The ribbon is Cherry Cobbler Double Stitched Ribbon. I used Dimensionals under the cup and the sentiment and finished off with Clear Wink of Steller. Here is a picture of the indside of the card.